Wwise 2019.1 is out and available for you to download from the Wwise Launcher. This version includes one of GDC19's most crowd-pleasing features, the Voice Inspector, sought-after spatial audio developments, interactive music functionalities providing greater design ease and flexibility, along with several other user-experience, workflow, and performance improvements. So, unless you're currently working on a project using a previous version of Wwise and therefore need to remain within that branch and its patches, we highly recommend upgrading to Wwise 2019.1. Our goal is to make interactive audio accessible to all, while empowering our more experienced users as they implement more complex interactivity. So, no matter what experience you have with Wwise and interactive audio, Wwise 2019.1 will certainly make your life a lot easier, and help open portals to your universe of creativity. Introducing the Voice Inspector. With so much flexibility in Wwise, it doesn’t require a large project before the question Why is this sound’s volume so low? presents itself. The Voice Inspector answers this question by revealing all volume, LPF, and HPF modifications throughout the lifetime of a voice. 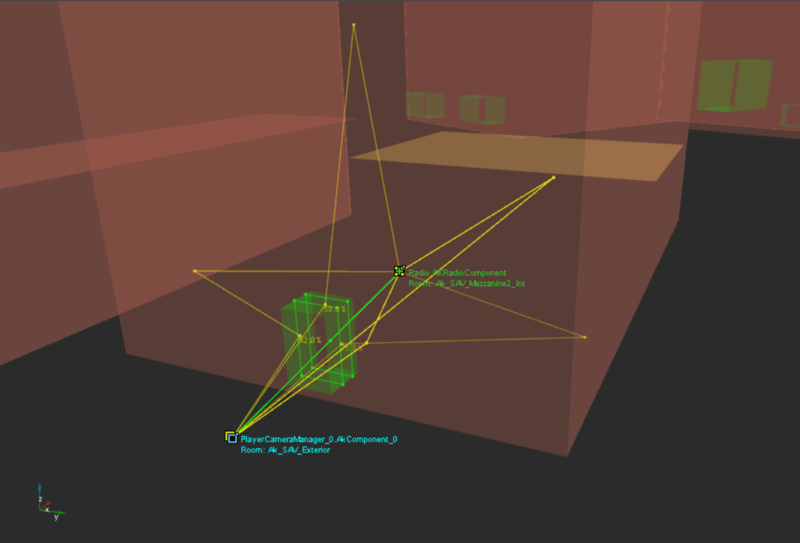 The Voice Graph panel of the Voice Inspector focuses on a single voice at a time and details each connection, path (“dry” and “wet” path(s)) and ray (connecting multiple listener to game object relations), which eliminates the guesswork when investigating property modifications in full details. Auto-ducking, makeup gain, randomizer, certain API calls, etc. Additionally, Wwise has a new layout: the Voice Profiler (F11). The Voice Profiler layout is centered on the Voice Inspector but also includes the Voice Monitor, which provides an overview of all voice volumes and an easy way to scroll the timeline of the captured session. Wwise events can now be triggered from Music Segments. This opens all sorts of new scenarios to further tie the music to gameplay or add sonic variations to the game’s score. Music Playlist Containers have two new music transition Destination Jump options, namely Last Played Segment and Next Segment. When returning to a playlist, it is now possible to resume from where you left off, instead of from the beginning. For example, if Music Segments A, B, and C have played in one Music Playlist Container before transitioning to another, you can now resume at the beginning of C or D of that previous Music Playlist Container instead of being forced to start over with A.
Spatial Audio continues to evolve with optimizations in behavior and performance. When an emitter is not in the same room as the listener but the sound is still audible through a portal, Wwise Reflect early reflection calculations are now performed with portal diffraction applied to the reflected paths. In the case where an emitter is not in the same room as the listener, the sound paths are calculated as a combination of paths generated by geometric diffraction (ie. edge diffraction) and portal diffraction. Reflections are able to pass through portals, even if there are up to two planes intersecting the opening of the portal. Since the portal itself describes an acoustic opening, it is not necessary to also 'cut holes' in the geometry to allow a sound to pass through, which significantly reduces the total number of triangles needed for sound propagation. Reduce update rate: A new spatial audio initialization parameter controls a movement threshold. 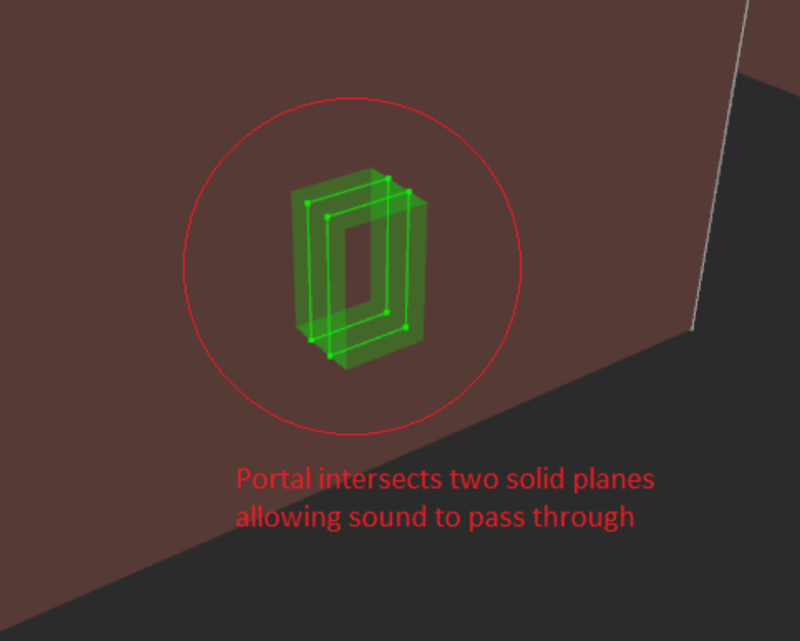 As long as the emitter and listener do not move outside of a radius defined by the threshold, then spatial audio will not perform a new calculation. This allows for reduced CPU utilization at the expense of reduced accuracy. In practice, it is not necessary to update the paths calculations every single frame, and a compromise between accuracy and CPU usage can be found. Multi-threading support: Enabling multi-threading in the Wwise Sound Engine via the platform init settings now also allows Spatial Audio to perform path calculations for multiple sound emitters across multiple threads. Limit geometry to the scope of a single room: As an optimization, it is now possible to limit the search space for reflective surfaces and ray intersection calculations by assigning sound propagation geometry sets to individual rooms. The Wwise authoring tool is spiffier than ever with a variety of additions and changes. 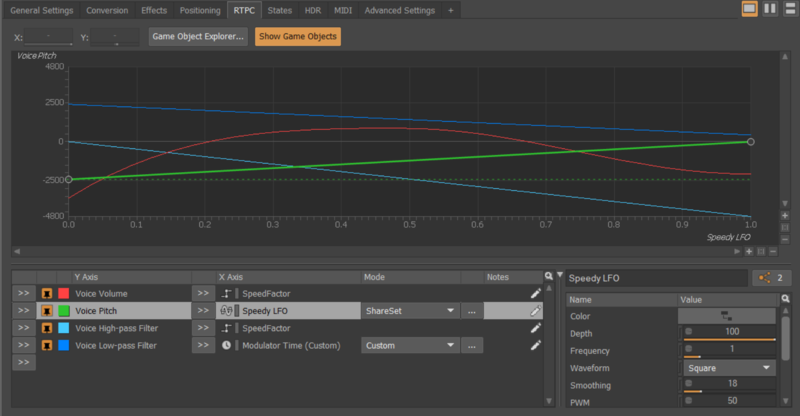 The RTPC tab now has a panel on the right side of the curve list which grants direct access to change game parameters, MIDI, LFO, Envelope and Time property values. A new “Find All References” button has been added which has the dual function of indicating how many objects are sharing the same modifier and opening the Reference View when clicking on it. RTPCs can now be added directly from contextual menu (right-click) on sliders, faders, dropdowns and checkboxes. A horizontal splitter has been added which is quite useful for objects using many curves. New "Enable Attenuation" RTPC-able property lets you control whether or not to apply the Attenuation ShareSet. 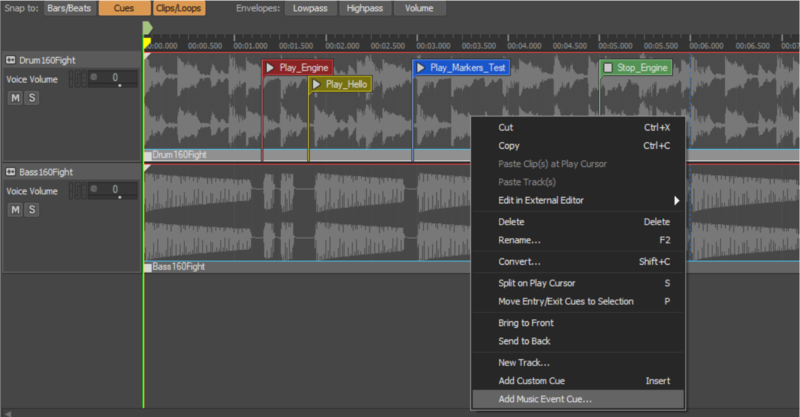 The Source Editor view has been re-organized to maximize waveform editing. All source properties are now displayed to the right of the waveform in a resizable and collapsible pane. Markers are now visible in the Source Editor and it's possible to change their position and rename them. Copying and pasting objects onto themselves duplicates objects without having to select the parent object. The last used layout is now saved and automatically restored on project load. Unlinked properties are now supported when importing Work Units (WWU files) from different projects. The new Logs view incorporates start-up, project load, SoundBank generation, audio file conversion and WAAPI messages. This new view replaces Project Load Log and SoundBank Generation Log views. A summary of the log information has been added to the upper-right corner in Wwise and double-clicking on it opens the Logs view. A new experimental Light skin UI provides a higher contrast than the classic skin. Mute and Solo keyboard shortcuts now default to Alt+M and Alt+S. Tab key in the Project Explorer can be used to navigate in the hierarchy. Button tooltips now show their associated keyboard shortcut key. Previous and Next frame in the Profiler layout are now associated to Alt+, and Alt+.. Performance optimizations for all envelope types. Modulations can be quickly added by right-clicking on the Modulator UI icons. Double-clicking a modulator icon selects it in the modulation list. Learn more about SoundSeed Grain by watching this product overview. Several areas of Wwise were optimized. The in-game overhead of profiling with Wwise has been greatly improved. Users who noticed slowdowns in the past when profiling should see significant improvements. The Performance Monitor now displays averages for which the sampling interval is configurable per curve. 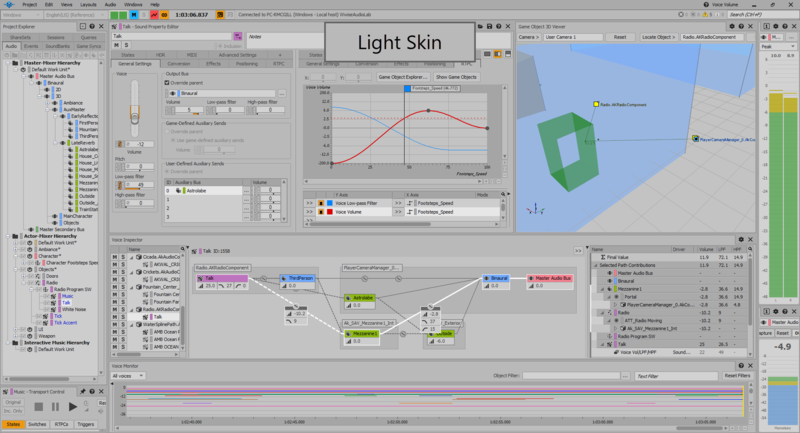 The Audio Thread CPU and Total Plug-in CPU timers have been set to high frequency per audio frame resolution, while the other curves have been left to the old sampling interval of 200 ms.
Spatial Audio can now issue individual reflection and diffraction processing tasks to the game engine's job scheduler, allowing tasks to be executed in parallel across CPU cores and improving overall system efficiency by better utilizing available CPU resources. RTPC and Virtual Voice Management performance improvements. The Crankcase REV source plug-in now runs from 4x to 10x faster than before. The original ADPCM encoder has been replaced by Platinum Games ADPCM that offers better quality encoding. Old ADPCM files are still compatible. Please also see the There is no longer an Encoding Mode property associated with the ADPCM codec migration note. The Opus codec has been updated to version 1.3, which brings quality improvements, especially for speech at low bitrates. Ambisonics is also fully supported now with this update. For devices running Android 8.1 and above, Wwise now supports the AAudio low-latency API. Based on hardware, Wwise now automatically increases buffer sizes in cases of voice starvation. WwiseCLI now supports the -LoadProject option to quickly load a project and exit. Used along with -Save, it enables automated project migration. WAAPI has a dedicated tab in the new Logs view. Please also see the Waapi Log Item Format migration note. WAAPI is now enabled by default, allowing localhost connections out of the box. WAAPI return options now have support for cascading expressions. Various other WAAPI improvements, such as profiler functions and a randomizer setter. Platform-specific initialization settings and generated SoundBank folders are now exposed and configured from UE4 project settings. GetRTPCValue and SetMultipleSpeakerEmitterPositions are now exposed to Blueprint. Wwise 2019.1 is now available for download from the Wwise Launcher's Wwise tab! If you do not yet have the Wwise Launcher installed, you can download it here. Audiokinetic sets new standards in audio production for interactive media and games. The company’s middleware solutions, including the award-winning Wwise® and SoundSeed®, empower sound designers and audio programmers with a cost effective, comprehensive authoring tool and audio engine for creating innovative interactive experiences. Audiokinetic is headquartered in Montréal, QC, Canada and has an office in Tokyo, Japan and Product experts in China and Europe. When you say, "The Crankcase REV source plug-in now runs from 4x to 10x faster than before." does that mean like a 4-10x gain on CPU at run-time? That's just a huge jump in improvement, and I'd be gladly surprised if that really is the case. Wow lots of genius at work here. Great work guys! Tips from the Wwise Dev. Team!